Trip the light fantastic at BGS Gala Ball! 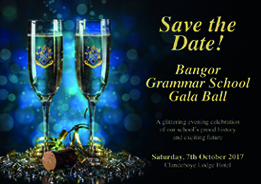 Now a well-established and well-attended event thanks to the endeavours of the School’s hardworking PTA, this year’s BGS Gala Ball will be held at the Clandeboye Lodge Hotel on Saturday 7 October. With a champagne reception, four-course gourmet dinner, high prize ballot, dancing, and live entertainment, including the School Jazz Band and mentalist Joel Mawhinney, this will be an exciting and action-packed evening. Tickets cost just £45 each and are available by emailing bgsgalaball@gmail.com. Organised by the Parent Teacher Association, all proceeds will go to support the activities of the School. Tickets for the last Gala Ball were sold out and the organisers expect demand to be high for the 2017 event. To secure your seat(s), or a table for 10 people, the PTA will require a deposit of £20 per person, or payment in full, by Friday 31 March (cheques payable to Bangor Grammar School PTA and marked for the attention of the PTA Treasurer). If you are a business owner or if you have family or friends who would be willing to help the PTA’s fundraising efforts by providing a ballot prize or sponsorship, contact the same email address. “We hope you’ll dig out your glad rags and your dancing shoes and join us for the social event of the year!” says a PTA spokesperson.